The DBD-20X heavy-duty portable rebar bender helps save valuable man-hours by bending rebar up to #6 (3/4”) grade 60 at the job site or in your shop. This strong electrical-mechanical bender has two preset angle locks for repeating the same angle bend. The dial-type angle selector can be set to accurately bend any angle from 0-180 degrees. An emergency stop switch and two side lifting handles are standard features. 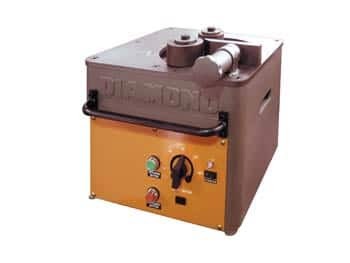 The DBD-20X portable rebar bender comes complete with set of (6) bending rollers in a steel carrying case, a tool kit, and a standard foot pedal control switch for hands-free bending.